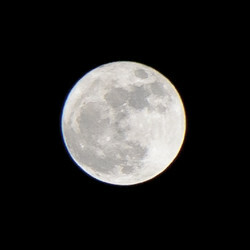 Tonight, the full moon is coinciding with the fact that the Moon is at its closest distance to Earth, it's the Supermoon. The moon is 14% bigger and 30% brighter. Yesterday a friend of mine said it would be difficult to observe this as London was covered by "more clouds than cloud computing" :-D But we are very lucky because, today, we had a lovely bright and warm sunny day, and the the stayed clear until now (midnight). My wife and I had a walk outside and I tried to grab a shot of the Moon with a 105mm, well with a lens like this, you can't expect a big shot.